Multicast is a very popular bandwidth-conserving technology exploited in many multimedia applications. However, existing standards of high rate wireless networks provide no error recovery mechanism (ARQ) for multicast traffic. ARQ absence in wireless networks unreliable by their nature leads to frequent packet losses, which is inappropriate for most of multimedia applications. In this paper, we study new reliable multicast mechanism proposed recently to support multimedia QoS (packet loss ratio, latency, and throughput) with various wireless technologies. This mechanism is based on the concept of multiple ACK-leaders, that is, multicast recipients responsible for acknowledging data packets. We develop analytical models of the mechanism with various leader selection schemes and use the models to study the schemes efficiency and to optimize them. Numerical results show that the novel multicast mechanism with multiple ACK-leaders can be easily tuned to meet specific QoS requirements of multimedia or any other multicast applications. Wide spreading of wireless networks increases diversity of wireless multimedia services. However, it is very hard to meet strict QoS requirements of multimedia services in wireless networks because of the error-prone nature of wireless media and random access techniques commonly used in wireless protocols. In wireless networks, an access method based on channel reservation is the best way to provide parameterized quality of service (QoS) for multimedia streams. Channel reservation is easily provided with centralized control, when the access point (AP), also called the base station, schedules data transmissions according to specific demands of multimedia services and applications. Almost all existing wireless MAC protocols include centralized control: the IEEE 802.16 MAC  for wireless MANs is centralized as a whole; in the IEEE 802.11  and 802.15.3  MACs for wireless LANs and PANs, the AP controls access to the channel and can provide collision-free operation periodically. With distributed control, collision-free periods can be provided too via a negotiation process between neighbor stations: see MCCA in IEEE 802.11s mesh networks  and DRP in WiMedia WPANs . In this paper, we assume that multimedia flows are transmitted in specially dedicated collision-free periods. Arranging such intervals, modern MAC protocols of high rate wireless networks support perfectly parameterized QoS for unicast transmission. As to multicast transmissions, parameterized QoS is not supported because conventional automatic repeat request (ARQ) schemes used for unicast are not applicable to multicast connections. Multicast itself is known to be a bandwidth-conserving technology that reduces traffic by delivering the same data stream to multiple recipients simultaneously. Stations interested in receiving the data stream are included into the related multicast group and are referred to as multicast group members. At MAC layer, a multicast group is identified by a multicast MAC address. The stream originator sends its packets with the destination address field set to the multicast MAC address. Various applications such as TV and radio broadcasting, gaming, videoconferencing, corporate communications, distance learning, news, and so forth, which use multicast transmission techniques, already crowded the market. In addition, most of these applications impose strict QoS requirements, such as minimal throughput, maximal packet loss ratio (PLR), and latency, and so forth, implying a large number of devices in the network. Almost all multicast applications rely on network layer multicast protocols only. However, these multicast solutions do not take advantages of the broadcast nature of the wireless medium. The efficiency of network layer multicast protocols in terms of QoS can be greatly improved by providing additional local QoS support at the underlying MAC layer. In this paper, we focus on multicast QoS support at the MAC layer, that is, reliable data delivery across single-hop wireless links by facilitating local error recovery. It is known that reliable traffic delivery is one of the main application requirements. The reliability index is PLR. Unfortunately, multicast QoS in part of requirement on maximal PLR is not supported by modern MAC protocols of high rate wireless networks because of ARQ absence for multicast. However, these protocols have potential tools to implement multicast ARQ schemes. In the next section, we give some background on existing ARQ-based MAC layer approaches, which aim to achieve multicast reliability. Further, in Sections 3–5, we focus on reliable multicast schemes which parameters can be tuned to meet application QoS requirements, develop analytical models of these multicast schemes, and use the models to optimize the schemes. Finally, we present numerical results and summarize the paper. To our best knowledge, all reliable MAC layer multicast proposals have been developed for 802.11 WLANs (some of them have been presented at IEEE 802.11 Working Group sessions), but ideas of the proposals can be extended and/or adapted to other MAC protocols of high rate wireless networks. In 2001, Kuri and Kasera  described leader-based protocol (LBP). In LBP, the only leader is selected from all the multicast recipients. This leader is responsible for sending Clear-To-Send (CTS) frames in reply to ready-to-send (RTS) frames and acknowledgements (ACKs) in reply to data frames. The leader is also allowed to send negative CTS (NCTS) or negative ACK (NAK) in cases when either it is not ready to receive the data because of some reasons, or the received data frame is corrupted. All other multicast recipients are only allowed to send NCTS and NAK. The problem of leader choice is not solved in . Chao et al. 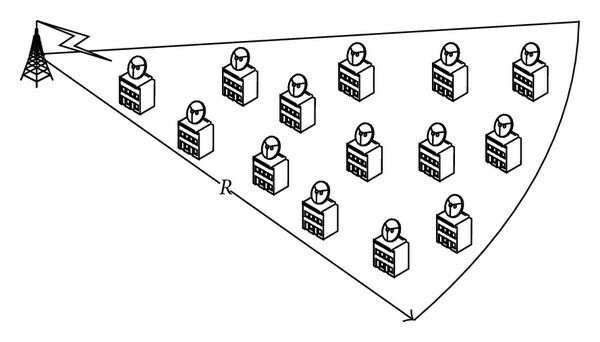 proposed in  the random leader technique, according to which the leader is chosen randomly among all recipients with equal probabilities. However, this choice technique does not seem efficient because recipients usually operate in different channel conditions. In 2007, LG Electronics and INRIA used the idea of LBP in their proposal  to IEEE 802.11v task group. However, the proposal did not include all original LBP features due to incompatibility of original LBP with conventional IEEE 802.11. NCTS and NAK mechanisms were removed from original LBP, because of their absence in conventional IEEE 802.11. According to the proposed leader selection scheme , the recipient operating in the worst channel conditions is selected as a leader. In BSMA proposed in 2000, the ARQ scheme is based on the NAK frames and thus has the same drawbacks as the original LBP. Furthermore, collisions of CTS frames sent by all recipients are inevitable in BSMA. The idea of the BMW protocol (see Figure 1(a)) is to implement ARQ for every multicast packet as multiple unicast transmissions of CTS, RTS and positive ACK frames, that is, using the conventional IEEE 802.11 DCF MAC with some minor modifications. Comparing with BSMA which shows little reliability improvement over the legacy IEEE 802.11 multicast, the BMW protocol is more reliable, because the sender retransmits the data frame until it receives an ACK from every recipient. In spite of its high reliability, the BMW protocol is inefficient for delay-sensitive applications due to multiple contention phases between consecutive ACKs following a multicast data packet. For example, given multicast recipients in the network, the protocol needs to perform contention phases to receive an ACK from every recipient. In 2002, the BMMM protocol was proposed , which consolidates contention phases of the BMW protocol into one phase (see Figure 1(b)). The multicast originator sends unicast RTSs to every device in multicast group. If the originator does not receive a CTS frame from any of the recipients in multicast group, it defers the transmission and enters the contention phase. Otherwise, it sends a multicast data frame and then unicast Request for ACK (RAK) frames to each of the multicast recipients successively. BMMM and BMW are the most reliable protocols among ones described above. But in contrast to BMW, there are no contention phases between consecutive ACKs in BMMM. However, the BMMM overhead increases with the number of devices in the multicast group. Even with a few number of recipients, the overhead consisting in RTSs, CTSs, RAKs and ACKs is bigger than the multicast packet itself. In , the BMMM extension called location aware multicast MAC protocol (LAMM) was proposed. Authors propose to use location information obtained by means of global position system (GPS) to further improve the BMMM. Since a GPS receiver must be implemented together with IEEE 802.11 transmitter, this may result in considerable increasing of power consumption and cost of IEEE 802.11 devices, while industry and market are moving towards low-power portable mobile devices, which must be as cheap as possible. The same problems are inherent to other reliable multicast protocols [12, 13], which utilize so-called busy tones. By incorporating busy tones into the protocol, authors attempt to reduce the probability of multicast frame corruption due to collisions and hence the number of retransmissions. These approaches assume that every device has an additional RF circuit to transmit and receive on busy tones. Additional spectrum bands are needed to utilize the busy tones. Moreover, the intruder hazard becomes the central issue. The tones are absolutely unprotected against clogging. An unauthorized signal emitted by any device in the coverage area of the multicast originator even at one of the tones may lead to complete blocking of multicast data flow. With regard to above discussion, it becomes clear that an ARQ policy with positive ACKs is preferable to one with NAK. Utilizing additional frequency bands as long as additional transceivers is also unacceptable. So, in 2007 we developed new reliable multicast scheme called the enhanced leader based protocol (ELBP)  using the most appropriate LBP and BMMM approaches as base points. LBP assumes the recipient operating in the worst channel conditions is chosen to be the leader responsible for sending ACKs. This method provides very low delays, but at the expense of high PLRs for nonleader recipients. Assuming every recipient to be a leader, BMMM provides the best reliability and thus the lowest PLR at the expense of high delay. The method we proposed and presented to the IEEE 802.11 VTS (video traffic streaming) study group [15, 16] takes into account the trade-off between reliability and delay and can meet specific QoS requirements. As mentioned above, BMMM overhead that includes a transmission of a lot of ACKs after every packet increases with the number of recipients. To reduce the huge BMMM overhead per packet, ELBP uses the block acknowledgment scheme introduced in IEEE 802.11e : a recipient requested by the Block ACK request (BAR) frame acknowledges a burst of multiple data frames by only one Block-ACK (B-ACK) frame. B-ACK frame includes a bitmap with positive or negative feedback on each packet transmitted in the burst. To protect data frames in the burst, IEEE 802.11e recommends to carry out the RTS-CTS exchange before the data burst transmission. 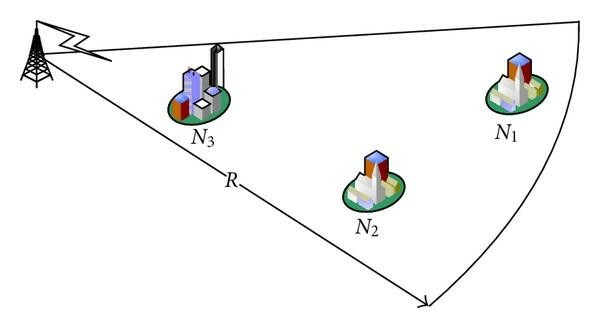 In scenarios without hidden stations, it is enough to send the RTS frame to only one of recipients (as shown in Figure 2), which can be chosen randomly for every multicast data transmission. 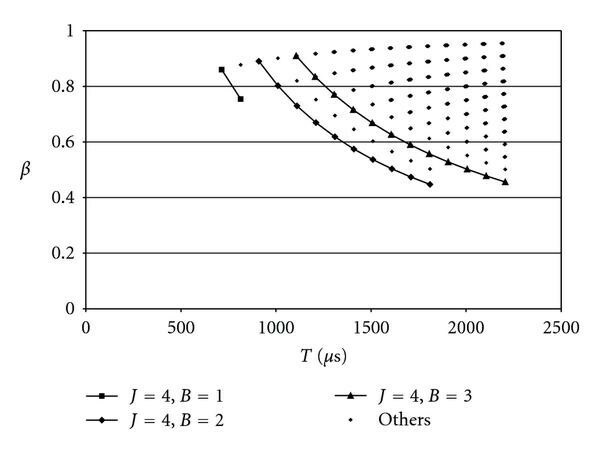 Obviously, the RTS/CTS exchange is not needed at all if the ELBP burst is transmitted within a collision-free interval. If the multicast originator exchanges BAR and B-ACK frames with all multicast recipients (similarly to the BMMM approach), it may cause long transmission delay which is not appropriate for some applications (real-time multimedia streaming, gaming, etc.) due to their QoS requirements, especially when there are many multicast recipients in the network. To reduce the delay, in the ELBP the multicast originator sends BARs not to all recipients, but only to a subset of them. In the extreme case, the number of stations in this subset can be reduced to one as it is in LBP. But the only leader may be not enough to provide reliable multicast and thus, to meet QoS requirements for all multicast recipients. To not rely on the only leader, ELBP uses several leaders which reply with B-ACK and are referred to as ACK-leaders. Figure 2 shows a typical ELBP burst where all frames are separated by SIFS intervals. After transmission of recurrent data burst, the multicast sender prepares multicast packets for the next burst transmission, including both new packets and packets not acknowledged previously by all ACK-leaders and which life time is not expired. ELBP burst structure (3 ACK-leaders). ELBP was actively discussed in the IEEE 802.11aa task group, which was created from the IEEE 802.11 VTS study group in 2008 to enhance the 802.11 MAC for robust audio video streaming. In particular, original ELBP and its modifications were described in . The common goal of these modifications is to decrease the ELBP overhead by sending the only multicast BAR instead of several unicast BARs. If ACK-leaders receiving the multicast BAR reply immediately, B-ACK collisions are inevitable. The collisions can be avoided in different ways. The first way is to use delayed ACKs instead of immediate ACKs, but it increases the delay because of several contention phases separated B-ACKs. The second way is to transmit the ELBP burst, using some protection mechanism (HCCA, MCCA, or PSMP as in ), and to schedule strictly B-ACK transmissions within a contention-free interval dedicated for the ELBP burst. Specifically, the D0.02 draft of the IEEE 802.11aa amendment  introduced more reliable groupcast (MRG) service representing a modified ELBP. According to MRG Block Ack procedure, the AP being a source of multicast traffic asks a subset of recipients for acknowledgments by sending a special multicast BAR frame with immediate ACK-policy: see Figure 3. The frame differs from the legacy BAR in the Information field indicating an ordered list of ACK-leaders. An ACK-leader indicated the th in the list shall transmit B-ACK at a delay of after the BAR, where is B-ACK transmission duration. 802. 11aa more reliable groupcast. However, it appeared that IEEE 802.11 channel access method (CSMA/CA) should be changed to transmit B-ACKs according to the strict schedule indicated in the BAR. Due to the reason the MRG service was removed from the draft of the IEEE 802.11aa amendment. The current draft of the IEEE 802.11aa amendment  introduces groupcast with Retries (GCR) service with block-ACK retransmission policy which is very similar to the original ELBP approach. The IEEE 802.11aa Task Group approved the GCR service as a base approach of reliable multicasting in IEEE 802.11 standard. Since that, the GCR/ELBP is a very promising reliable multicast technique for infrastructure and mesh IEEE 802.11 networks and is a matter of special interest for analysis and optimization. In the paper, we develop analytical models of the GCR/ELBP mechanism with various leader selection schemes and use the models to study leader selection schemes efficiency and to optimize them. In  we have shown that the ELBP approach, when multiple multicast packets related to the same stream are set as a single burst and a subset of recipients are requested for acknowledgments, can be used also in IEEE 802.16 networks. IEEE 802.16 network operation time is divided into fixed size frames by means of time division duplexing operation mode. A frame consists of a downlink subframe for transmission from the base station to subscriber stations and an uplink subframe for transmissions in the reverse direction. IEEE 802.16 frame structure is shown in Figure 4. In the downlink subframe, the downlink MAP (DL-MAP) and Uplink MAP (UL-MAP) messages are transmitted by the base station, which comprise the bandwidth allocations for data transmission in both downlink and uplink directions, respectively. An ARQ is provided by allocating a special ACK-Channel (ACK-CH) in the uplink subframe for subscriber stations. Bandwidth allocated for this channel depends on how many stations replies with ACK and could not be very large because the uplink subframe itself is tightly bounded and there are a lot of other data in it. IEEE 802. 16 frame structure. The main open issue of the ELBP approach is how to select ACK-leaders. In the next section, we show that the answer depends on QoS requirements. In Sections 4 and 5, we propose accurate analytical models helping to select ACK-leaders and to tune other ELBP parameters, assuming that ELBP bursts are transmitted in contention-free intervals provided by some protection mechanism. In ELBP, there are two interconnected questions to answer. The first question is how many ACK-leaders should be selected. The second question is which recipients are the best candidates to be ACK-leaders or, in other words, how to select the required number of ACK-leaders from all recipients. We may choose them randomly with equal probabilities for every new burst, as in . However, it seems that equiprobable leader choice is not the best way to support reliability and to meet QoS requirements, because the scheme does not take recipients' PLR, throughput and latency into account. Generally, ACK-leader selection scheme may be a function of QoS requirements, reliability and performance indices, as well as some other metrics, for example, packet error rate (PER). Since the way of ACK-leaders selection depends highly on QoS requirements, a precise QoS definition is necessary. In this paper, we consider three QoS requirements. The second QoS requirement is the maximum latency . In our case, latency is the time interval spent to transmit a packet, including possible retransmissions, or in other words, the time interval between the ends of transmissions of consecutive packets. This performance index is very important for delay-sensitive applications. If a packet is not transmitted for , there is no need to transmit it further. Thus, the multicast scheme must meet the QoS requirement on the maximum latency. It may be done by setting the MAC layer maximal lifetime of a packet to . the number of ACK-leaders for every data burst transmission. Anyway, there exists a lower limit of : for 802.11 HCCA and MCCA and for 802.16 networks. Leader selection scheme is another ELBP powerful tool. We have already mentioned that equiprobable leader choice may be not the best way to meet QoS requirements for all recipients. Another possible way of ACK-leaders selection is to fix recipients, based on the experienced PER, and consider them as ACK-leaders for every burst transmission. In particular, we propose to select the recipients with higher PER and fix them as ACK-leaders. Further, we refer to this ACK-leader selection scheme as to ELBP with fixed ACK-leaders or just fixed ELBP. One more scheme is to select recipients as ACK-leaders randomly according to some PER dependent weight function. Every round of multicast transmission, multicast originator selects ACK-leaders out of all recipients according to weights assigned to every recipient by some weight function . Further, we refer to this ACK-leader selection scheme as to ELBP with weighted ACK-leaders or weighted ELBP for short. In the next two sections, we develop analytical models of fixed and weighted ELBP leader selection schemes. In Section 6, we use the models to find the best solution for various multicast usecases. To develop an analytical model of this multicast scheme, we need to make some definitions and assumptions, first. Let and be the numbers of multicast recipients and ACK-leaders respectively, where . All packets are assumed to be of the same payload size in bytes. Multicast originator is assumed to work in saturation. Let be the PER for the th recipient. We enumerate recipients in the order of decreasing PERs, that is, the first recipient has the highest PER and first recipients serve as ACK-leaders. Due to 802.11 control frames (as well as ACK messages, DL- and UL-MAP in 802.16) are relatively short and are usually transmitted with highest coding gain, we neglect their error probabilities. where is a flooring function. Further, we use as the transmission attempt number. where equal to for an ACK-leader and for nonACK-leader. In the subsection, we derive the necessary condition with which the QoS satisfaction is possible for all recipients. We also find some bounds of and to make their optimization faster and easier. For that, we build a system of inequalities which helps us to find the bounds of and values, based on QoS requirements. Inequality (20) is the necessary condition for reliable multicast. Indeed, if the right inequality in (20) does not hold, the QoS can not be supported by the ELBP. In this case, we recommend to decrease to the necessary value by decreasing the packet length and/or bit rate. Using the second inequality in (19), we prove the following theorem. should not be selected as ACK-leaders. Solving the quadratic inequality , we prove that it holds with , where is determined by (21). Thus, (22) holds with . Now let . As follows from (10), increases with and hence . Since (22) holds with , it also holds with . Thus, the PLR of recipients, which PER is less than , is less than , and such recipients should not be selected as ACK-leaders. Thus, in the optimization we need to consider and only, where is the minimal recipient number which PER is less than defined by (21). For the ELBP with weighted ACK-leaders, ACK-leaders are reselected every time before a burst transmission. The selection is performed from the whole set of recipients, according to their weights . Let us partition all recipients into sets. In set , there are recipients, which PER is nearly the same and approximately equal to . Obviously, we assign the same weights to all recipients of set that makes optimization of the weight distribution easier. This partition makes numerical analysis and optimization of the weighted ELBP much easier in the case of a large number of recipients. Of course, the partition is not reasonable with a small number of recipients. In this case, we just set and . where is the number of recipients selected to be ACK-leaders in set after selection steps. That is, , , is a selection vector indicating which recipients have been selected after steps. Obviously, and vector indicates all current ACK-leaders responsible for acknowledging the current data burst transmission. The multicast sender stops transmitting a packet when all current ACK-leaders acknowledge the packet and thus, receive the packet successfully. where . Here and further, for any and , if for all and . Throughput for any recipient from set is given by (17), where we substitute for . In this section, we use our analytical models to investigate and to optimize ELBP multicast schemes with different wireless technologies and in different use cases. As we don't apply any simplifications and assumptions about original ELBP multicast schemes, our mathematical models are accurate and there is no need to validate them via simulation. Although we use some simulation to obtain the input data (the dependence of recipient's PER on distance) for our analytical models. As the first usecase, let us consider an 802.11 HCCA WLAN, where the AP is the source of saturated multicast traffic. We assume that the AP transmits multimedia data packets with KB payload at 54 Mbps bit rate, using original ELBP scheme shown in Figure 2 (without RTS/CTS exchange since HCCA provides necessary protection). All model parameters correspond to the IEEE 802.11a defaults . Let all recipients be partitioned into sets so that recipients of the same set have the same PERs: see Table 1 for recipients with PER > 0.01. Let fixed ELBP be used. Since the way of ACK-leaders selection depends highly on QoS requirements, we need to specify them. Let , Mbps and ms (this value corresponds to the usual latency bound for video applications). Based on Theorem 1, we conclude that recipients from sets 1–4 only can be selected as ACK-leaders, that is, . in the found admitted region. We see that the following 2 tuples are close to optimum: , , and , . With or , QoS requirement on the maximum PLR is not met. Consumed bandwidth fraction versus periodicity. An IEEE 802.16 base station (BS) usually covers a large area with huge number of Subscriber Stations (SSs). To increase the network capacity and QoS provisioning, a BS is equipped with sector antenna. Each sector of this antenna covers a separate area with a part of all SSs in it, achieving spatial diversity. In fact, we can consider each sector as an individual IEEE 802.16 wireless network with its own BS, coverage area and set of SSs. So, further results will concern one of such sectors. Let us assume that the BS is a multicast sender and the only multicast data burst is transmitted in every frame, that is, . We also assume that the BS transmits a data burst consisted of multicast multimedia data packets with bytes payload at a maximal PHY data rate ( , 64-QAM) using ELBP mechanism with fixed ACK-leaders. With this PHY, one 512 bytes packet takes OFDM symbols, while an acknowledgment takes OFDM symbols. The 802.16 frame duration is ms and the maximum latency is ms. So, the maximal number of retransmissions is , according to (8). First, we consider more general case shown in Figure 6. In this usecase, the coverage area of the BS is a sector of circle with radius km and total number of SSs uniformly distributed across the sector. Sector with uniformly distributed SSs. To start numerical analysis we need to derive the dependence of recipient's PER on distance for the investigated network. We divide the process in two steps. First, we obtain the dependence of signal-to-noise ratio (SNR) on distance according to the path loss model in  with a critical parameter . After that we find PER(SNR) by MATLAB  simulation of IEEE 802.16 PHY for the highest PHY data rate ( , 64-QAM), using AWGN channel as a noise source. where and . 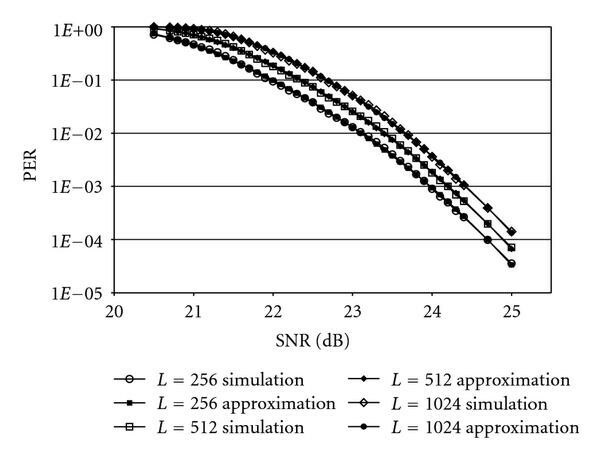 As it is shown in Figure 7, the proposed analytical approximation fits perfectly the simulation data. Using (38) with , we find PER for every recipient. The PER of the most distant SS is 0.1, that is, 10%. The closest SS has the PER equal to 0. As follows from (10), (12) and (14), PLR depends on station's PER and the number of ACK-leaders only. Thus, for a given number of stations and PER distribution, we can find the optimal number of ACK-leaders minimizing the bandwidth allocated for a given multicast connection per frame (see (7)), while meeting a certain QoS requirement on PLR for all recipients. In Figure 8, we show the relationship between and the maximal PLR over the network which contains , 50 and 100 SSs. The figure shows two of ELBP main advantages. Fixed ELBP: optimal number of ACK-leaders. The first advantage is the scalability. Indeed, even if the number of recipients is quite high ( ), the optimal number of ACK-leaders is still less than 10 for a wide range of values: 2–10%. We can see also that the optimal number of ACK-leaders is nearly proportional to the number of recipients. So, we can conclude the optimal number of ACK-leaders in fixed ELBP scheme is less than 10% over all multicast recipients in wide range of QoS requirements on maximal PLR. The second advantage is the supremacy over the pure LBP in reliability. Indeed, even if the number of multicast recipients is small ( ), LBP using only one ACK-leader cannot achieve PLR less than 4%. In contrast, ELBP can meet any preassigned QoS requirement on PLR (of course, cannot be less than at the given bit rate, in accordance with (20)). Let us consider the case, when there are multiple sets of recipients and recipients of the same set have the same PERs. For certainty, let us assume 3 sets in this usecase, which correspond to 3 small settlements covered by a single sector of an IEEE 802.16 BS as it is shown in Figure 9. The total number of recipients is . The first set consists of recipients with PER = 0.1; the second set has too and PER = 0.075, and the last set has recipients with PER = 0.01. Sector with multiple sets of SSs. Let us define QoS requirements. Let the maximum latency be 15 ms and thus = 3, maximal PLR be equal to 0.04, and minimum reserved rate be 4 Mbps. We compare three selection schemes: fixed ELBP, weighted ELBP and full random ELBP. For fixed ELBP scheme, we limit the range of and by = 6 and = 11, which are obtained by (16) and (17). For weighted ELBP, weights are assigned according to the principle of minimizing PLR over all stations in the network. Full random ELBP is the special case of weighted ELBP ACK-leader selection scheme with equiprobable weights . The PLR characteristics of these multicast schemes are shown in Figure 10. We can see that for weighted ELBP 4 ACK-leaders is enough to meet QoS requirement on maximal PLR, while minimizing in (7). In contrast, the other schemes need much more ACK-leaders. Fixed ELBP requires 8 ACK-leaders, and full random scheme needs to select 11 ACK-leaders. Maximal PLR versus the number of ACK-leaders. The next step of our investigation is to find the optimal burst size . 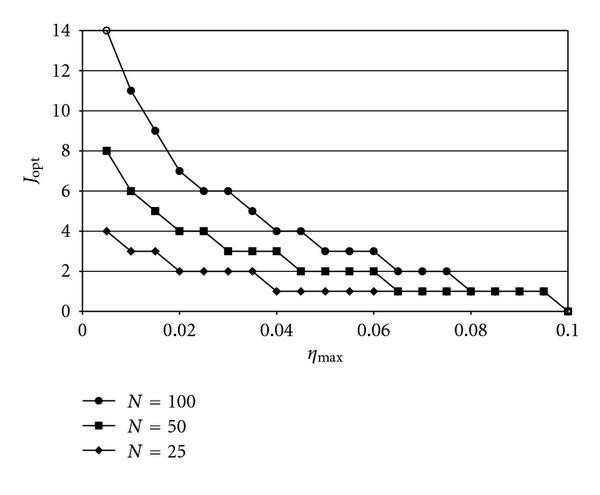 For that, we find how throughput depends on with optimal numbers of ACK-leaders found at the previous step. The throughput characteristics are given in Figure 11. 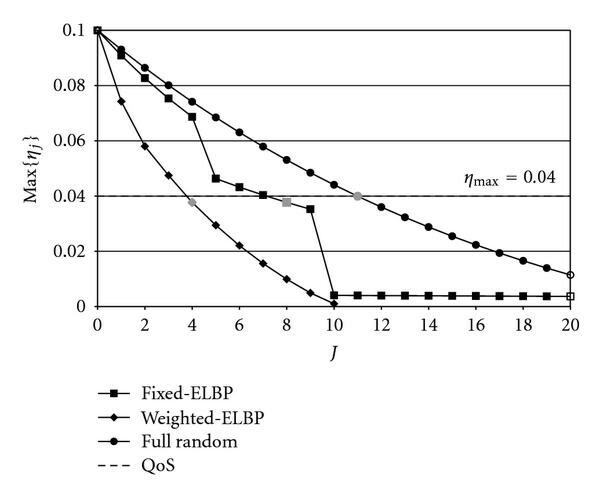 This figure shows that the optimal burst size which minimizes in (7) is equal to 7 in case of weighted ELBP, while it is equal to 8 for full random selection scheme and 9 for fixed ELBP. Minimal throughput versus the burst size. At last, let us show the allocated bandwidth with these selection schemes. 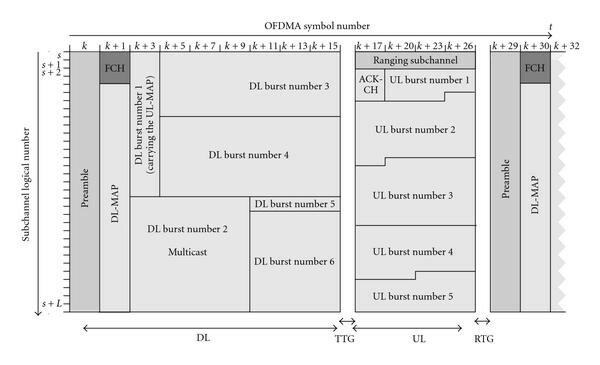 In Figure 12, we can see that the optimal weighted ELBP scheme requires 120 allocated OFDM symbols per frame to meet all QoS requirements of the transmitted multicast stream, while full random selection needs 150 symbols and fixed ELBP require 160 OFDM symbols. 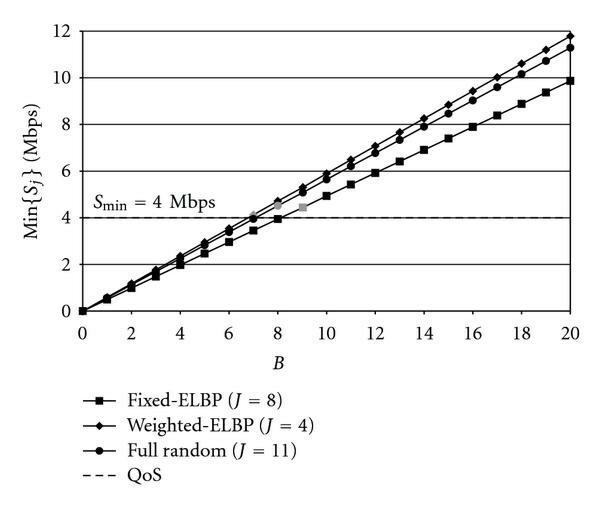 Here, we can conclude that weighted ELBP is the optimal approach of QoS support for multicast streaming, although its implementation may be more complicated, comparing with fixed ELBP and full random ELBP. Existing standards of high rate wireless networks consider multicast as unreliable service, which is inappropriate for many multimedia applications making strict QoS demands. In this paper, we study a promising enhanced leader based protocol (ELBP) for reliable multicasting in wireless networks. In ELBP, multicast packets are transmitted in bursts and several multicast recipients called the ACK-leaders are appointed to be responsible for multicast data packets acknowledging. Specific QoS requirements (maximal packets loss ratio, maximal latency, minimal reserved rate) can be met by varying such ELBP parameters as the number of ACK-leaders as well as the data burst size and periodicity. We consider two types of leader selection schemes: (i) ELBP with fixed ACK-leaders which experience higher PERs than other recipients, and (ii) ELBP with weighted ACK-leaders, where ACK-leaders are reselected according to recipients' weights before every data burst transmission. We develop accurate analytical models to estimate reliability and performance indices with these schemes and to find their optimal parameters. Numerical results obtained by the models show that ELBP can be used efficiently to meet specific multimedia application QoS demands, in contrast with well-known LBP and BMMM approaches when either only one recipient or all recipients acknowledge multicast packets. Both fixed and weighted ELBP are scalable multicast solutions: according to our model experiments, even with a large number of recipients it is enough to request a few recipients for acknowledgements to provide reliable multicast for all recipients. 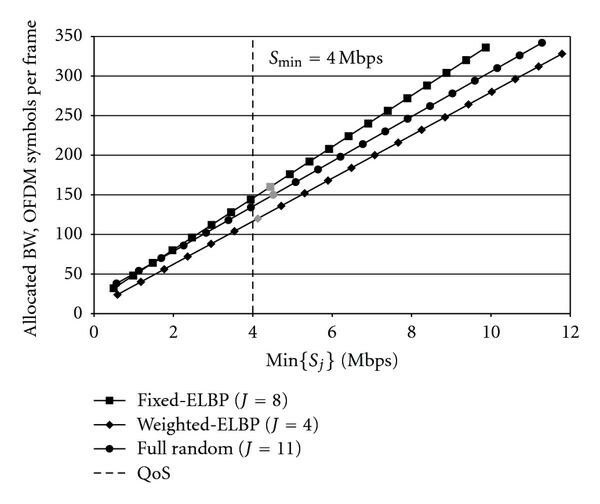 Comparing fixed and weighted ELBP, we show that weighted ELBP is more efficient in terms of consumed bandwidth. This work is partially supported by the European Union under project FP7-257263 (FLAVIA).